and/or make use of the Wiki: http://wiki.pistar.uk. "RPi" image is for Raspberry Pi Foundation hardware (Raspberry Pi). "NanoPi" image is for Friendlyarm's "Nano Pi Neo". "NanoPi_Air" image is for Friendlyarm's "Nano Pi Neo Air". "OrangePiZero" image is for Xunlong Software's "OrangePi Zero". "Odroid_XU4" image is for Hardkernel's Odroid "XU 3" and "XU 4". Service startup timers tweeked to improve (reduce) boot time. Already available as an upgrade, images coming soon. NanoPi Neo gets a new kernel and improved GPIO support. Orange Pi Zero gets a new kernel and improved GPIO support. Pre-Updated with the most recent changes. current OS updates / patches etc. with the Auto_AP function (now resolved). system too. Full integration of YSF2DMR, YSF2NXDN and YSF2P25. else on YSF requires DN mode). some control over it from the dashboard. new spin for that model will be avilable in the beta section shortly. exact chipset on the card. So what does AutoAP do I hear you ask? WiFi to configure another network. and of course OS patches too. that NXDN IDs are 2 bytes long, 0-65533. Pi-Star to maintain patches for the build process. 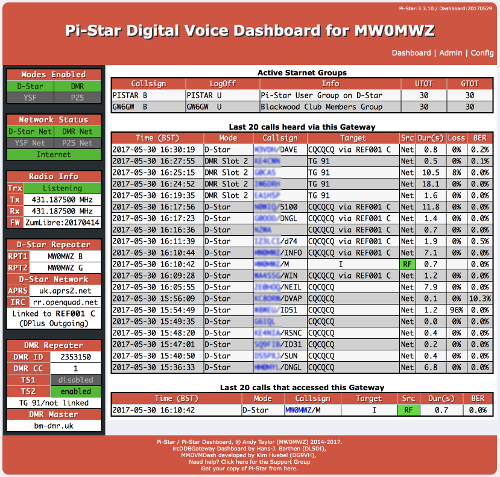 now fully integrated into Pi-Star. includes the update to P25Gateway. of them probably still do not. Your milage may vary. changes to the config for MMDVMHost in the System Fusion section. Improved WiFi support for Nano Pi / Orange Pi / Odroid. The OS is also updated with all current patches etc. the log files in the wrong folder. No new features, just adding updated images. current update / patch level. support on this platform - this brings it in-line with RPi. platform - this brings it in-line with RPi. this platform is now much closer to that of the RPi hardware. support, that is still lacking in this build, more on that soon. will not show up on the download page any more. previously, but it had been broken by the recent kernel changes. a larger heatsync that stock. Just re-creating the images, no special new features at this point. support on the NanoPi Neo. the need for a seperate SSH client. will be maintained as part of the OS. of the seperate hang timers for all modes. patches for it with a pull request submitted upstream. the issues with some USB modems. updates that are coming later. From this version forwards, *FULL* updates are available. need to write an image. D-Star hosts and for DMR hosts. and casuse the dashboard to fail to be available. we never get hit by this again. OS Updated as of 03-Jul-2017 including the Kernel updates etc. you need guidance on adding your own commands. No changes in base, just pre-updated with all the leatest updates. the same setup. Thanks OpenSpot guys! of it wiping the hosts files out if they cant be downloaded. Raspberry Pi boot code to be updated. some gremlins that are now cleaned up. Added CPU temp support in Farenheight. Official support for the FriendlyArm NanoPi Neo / Nano Pi Neo Air. now working the way it should again. dashboard are updated to the latest and greatest versions. the config portal in the dashboard. Shutdown / Reboot Buttons added to the dashboard. help mittigate the shortcomings of logrotate. the ACK packets coming back form the connected gateway. same bug will not cause issues with that. mode if you didn't spot it in the dashboard. between Pi-Star versions pain free. for this avilable here: PiStar Wiki. Apart from the above update, the latest Dashboard build is included. all, with more of the complex work happening on the back end. only run when you require D-Star Networking. This release contains the newest build of the dashboard (13-May-2017). most recent build of the dashboard (20170501). or newer already there is no need to upgrade to this release. through the configuration for the first time. Large number of changes on the back end, improving P25 and YSF modes. P25 Parrot added and fixed up. YSF Parrot added and fixed up. Dashboard modifications to enable better support of YSF. Dashboard modifications to enable better support of P25. Minor update process revision to fix a bug with kernel updates. the network setup for P25 is nolonger broken. able to make outbound connections. OS updates are handled to improve relyability. night, without user intervention - your security assured. Dashboard is now updatable without the need for re-imaging your Pi. an update option within the dashboard too. reason to release more / less often than that. pace with the update cycle. to start up, how long depended on your internet connection. would take 30 mins or more. start - its quicker than before I added this functionality! I know - no other image has this ability! Thank you Adrian (M0GLJ) for coming up with the idea for this one. MMDVMHost updated to latest release. Fixed a bug in the Modem Selection code on the dashboard. Modified the Firewall script to account for the numerous ports that YSF Hosts use. module to be linked back to itself - not a good idea. was *ALWAYS* using the "B" suffix for the module, no matter what. A few minor tweeks to the layout on the dashboard. Stopped any of the radio services when the node is not configured. Added free form input to the "Reflector Connector"
*ANY* reflector rather than just the known ones. Upgraded MMDVMHost to current release. Fixed bug in the config page that could wipe out the MMDVMHost config. Version bump to 3.1.0 to reflect the large amount of changes. Dashboard updated, inluding banners for a powercycle when changing modes. Admin pannel security hole found / fixed. JQuery and some added eye-candy. MMDVM Multi Mode working well with the current DVMega 3.07 Firmware. A large number of fixes to the control / admin pannels. Rasbian fully ipdated (including kernel fixed for "Dirty Cow"
Fed up of of auto-link to REF001 C failing when the REF system changes IP? confirm that I have the bugs worked out. the future but for now it can stay, its still under 500MB. this service and removed it from the normal startup / pistar-watchdog etc. New STARNetServer config added to the build process. New STARNet init script handles the config properly. when using multiple STARNet services at once. Firewall script was dropping all outbound ircDDB traffic - repaired. Added support for USB DVAP modules. Automatic patching of the base OS has been enabled. WiFi setup via the web portal has been improved. Improvements and prep for CSS7 (now a requirement on DCS reflectors). links on the image / copyright notice. Minor fixes on the web portals. registering the .local addresses on your local network. your connection heavily for gaming / downloading.